Ladybird Bubble Bar | £3.95 // This is such a cute bubble bar and actually a really good size compared to some of them. The scent is a bit of a strange one though and one I find quite hard to pin point. It's a mix of geranium and peppermint which shouldn't work but it kind of does. Flowering Tea Reusable Bubble Bar | £4.95 // I bought a couple of these last year when they were available in the Lush Kitchen. This was originally a Oxford Street exclusive but has been in a couple of other collections since. I love the design of this bubble bar and there's flower petals inside so it really does look like a tea bag. The reusable bubble bars last a really long time compared to the bubble bars if you leave them to dry out in-between uses. As you can imagine this has a very strong floral scent; neroli, orange flower, rosewood and blue cornflower. Rose Bombshell Bath Bomb | £3.95 // This has been redesigned this year and shares the same scent as Rose Jam. I actually really like the redesign as it makes it more fun to watch it fizz away in the bath as last years was plain white. The main scent is rose but it's broken up by lemon and geranium. Yummy Mummy Shower Cream | £4.95 - £27.95 // I love the strawberry scent and I like to use it with the body conditioner of the same name. This years version is much brighter in colour but the scent has stayed the same. I just bought a mini bottle as I still have a larger bottle from last year that I am working my way through. 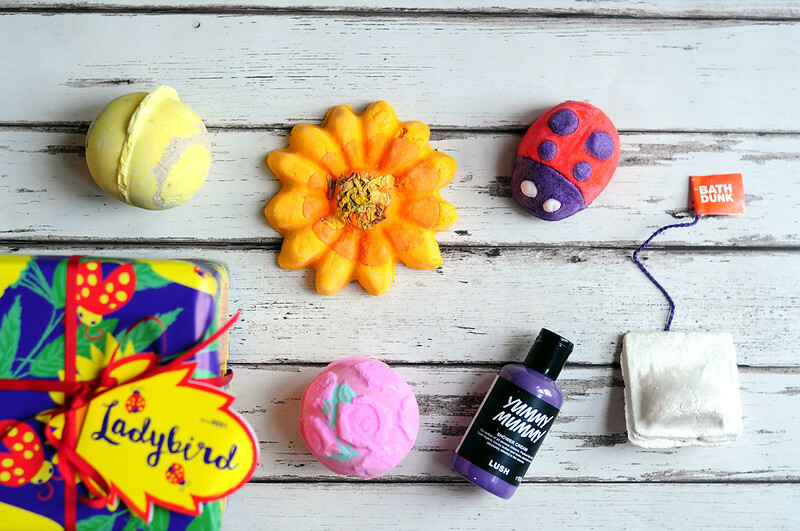 Sunflower Bubble Bar // I bought the Ladybird Gift Set so I could get this bubble bar as it currently is an Oxford Street exclusive. I had heard it would be released in the Kitchen at some point but this past week has been a Mothers Day menu and it hasn't been featured. I'm still hopeful it'll be brought out next week though and then I'll be able to buy some more for my mum and I. This bubble bar is huge and I think I could get about six baths out of it. I also love the design and the lemon sherbet scent. There is also a soap available, Sunrise. I have a million and one soaps I need to use first so I managed to talk myself out of buying it. It shares the same scent as Brightside Bubble Bar. I love the idea of the Flowering Tea Reusable Bubble Bar, it sounds great. I will have to try and find these! T'awwww, look at the lady bug, so cute. Love Ladybird, it smells amazeeee!